Create a in PPTX format that is much better than PowerPoint's work. Edraw is an easy and efficient solution. It works on both Mac OS X and Windows system. Read the following tutorial to find out how. PowerPoint doesn't offer any tools to create floor plan so Edraw cover this limitation. It can help both professional designers and beginners to build floor plans easily. 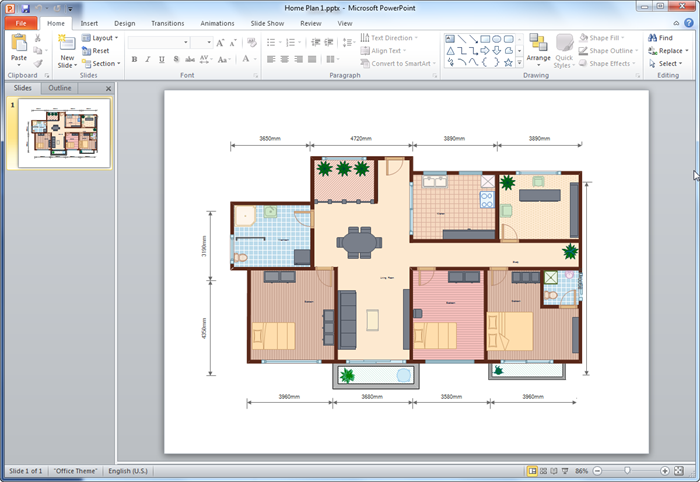 Meanwhile, Edraw supports to convert floor plan files into PPT format with a single click. Please check the following ppt floor plan. Isn't it satisfying? And no matter what devices you are using, Mac or PC, our cross-platform based software can work well. A floor plan is a simple line drawing that shows rooms as though seen from above. Walls, hallways and windows are often drawn to scale. From a floor plan of a house or building, you can know how the elements within a room are arranged. The difference between a floor plan and a construct is that a floor plan is simpler and a construction plan. To build a house, you need a complete set of construction plan that include floor plans, cross-section drawings, electrical plans, elevation drawings and many other kinds of diagrams. Start Edraw, open a floor plan drawing page. Drag the wall shape to form a room outline. Take advantage of the dynamic dimensions to gain the desired size of each room. Edraw also connect walls automatically for you. Add doors, windows and wall openings. Lay out your floor plan by using grid lines and quick Align and Distribute buttons. Edraw is compatible with MS PowerPoint, which means the EDDX files can be converted into PowerPoint files seamlessly. The picture above demonstrates the excellent results that it achieves. 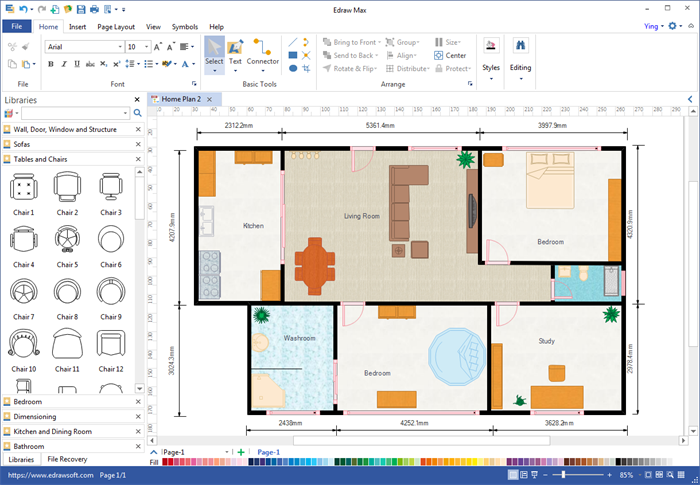 Creating a floor plan diagram in PPT is just one more click away: go to File tab, click Export button and choose PowerPoint to save your file as PPTX format.